These notes aren't 100% correct as they are constantly changing and are biased. I suggest you only use these notes as a supplement to your reading. Three giants in the scientific department helped create the incandescent lightbulb. This was a huge development. People can now light their homes, offices, and even better yet, communicate easier. Alternating current made the electric transmission possible over long distances. From 1890 to 1920, the amount of the American industry powered by electricity rose by 30%. Imagine over 1000 kids walking around with a forever lasting ipod. It's hard to imagine, but that's exactly what happened at that time. So what? Everything boomed. Older industries quickly ditched annoying steam power for the great pros of electric power. What did this do? It created whole new sectors in the metalworking and machine-tool industry. Now they have much more things to make, such as electric generators. Between 1900 and 1920, every major city built electric powered public transport systems. 40,000 miles of electric railway was installed between cities, subways in New York were made, and electric lighting was installed on the streets. Now you can find that stupid quarter that you dropped on the street. You know how this affects you, this is the reason why you are fretting over whether or not you have enough money for gas for your car. in 1878, the first gasoline engine was patented and the first car started making it's appearance on European and American roads. Several years later, in 1909, Henry Ford unveiled his Model T: a car fit for the everyday working man. What does this mean? It means you have to employ swarms of people to fill jobs in the coal, iron, oil, rubber, steel, machine, and road departments. Just a single man like Henry Ford's thoughts could not make his goal of making millions of cars happen. What you need is a huge corporation to help. Corporations was a big part of life before the 1840's but the last 19th and 20th century changed corporations like no other. Their size multiplied, and so did the need for hands. This was the pushing force for the building of cars, railroads, everyday items, and the expansion of science. Manufactures saw this great rise in the market and decided to respond to it with great intensity. They took this chance to completely change themselves. "Time is money" is the perfect phrase to describe their thinking. Get rid of all the skilled workers, replace them with machines, hire unskilled workers if needed, and minimize all the break time. This created the thinking of "Taylorism". The "science" on how to make humans a carbon copy of a machine. The managers, and engineers gained all the power of the factory, controlling work speeds and object quality. The assembly line came into people's lives and allowed manufactures to lower work time; which in turn, allows them to lower prices. The lower prices drove up consumption rates and it was a giant cycle. This growth was so great, it saw to a rise in the form of a sociology department, one that would create "benefits" for workers; such as Americanization classes. Although, this wasn't entirely a bad thing, as medical care, housing subsidies, and other benefits rose. 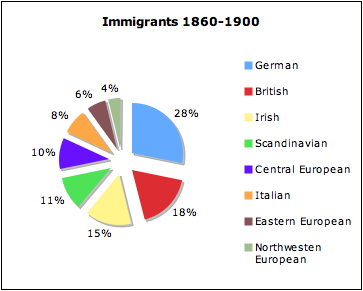 Between 1880 and 1914, most of the European immigrants came from Eastern and Southern Europe. Among them included Italians, Russians, Hungarians, and Slavs. These immigrants were coined the name "new immigrants". The new immigrants were looked down upon in society as people thought of them as racially inferior, culturally lacking, and politically retarded. Ironically, both the old and new immigrants were very similar. Both groups came to the United States for many of the same reasons: to flee religion or the government. Interestingly, the United States attracted a small stream of political refugees. These people held unusual talents such as labor organizers, and political agitators. Immigrants came in small streams, but sometimes there were huge groups of immigrants that entered the United States. These mass immigration times were propelled by hardships in Europe. Rural areas were growing faster than the land could support, so people felt the need to leave. Most of the immigrants were men. These people usually had contacts in America, left single, and they weren't planning on staying for long. Many saw America as a job opportunity; save up money, then go back home. This explains why most of the immigrants were men. Only such a thing as the First World War (which prohibited transatlantic travel) could stop immigrants from wanting to go back home. 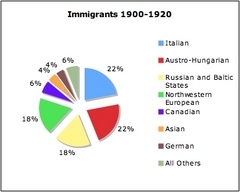 Compared to the European immigrants, there were relatively few Chinese and Japanese immigrants. These two groups were to contribute largely to the railroad service and commercial agriculture if it weren't for the U.S. government. The government passed the Chinese Exclusion Act, and also interpreted a law to make it so citizenship was prohibited for Chinese, Japanese, and other East Asian immigrants. This was to show that America's roots were only to be built with European descendants.